Preparing a closet and dressing your baby can be made easy with this guide to all things clothes. To start, always remember that newborns are very delicate. Being too hot or too cold can be tough on them. As a good rule of thumb, dress your baby in one more layer than you are wearing. When taking your baby outside in the sun, try to not have any of her skin showing. Their skin is very easily affected. Use a hat or find a stroller with a sunscreen over it. Never over bundle; babies will overheat fast. An easy way to check if your baby is the right temperature is to feel her neck. While their hands and feet are easy to find, they will most often be cool, and won't show how the baby actually feels. Other indications that show how your baby feels are crying and turning red if they are hot or shivering if cold. Every baby has different needs and different mothers have unique preferences. 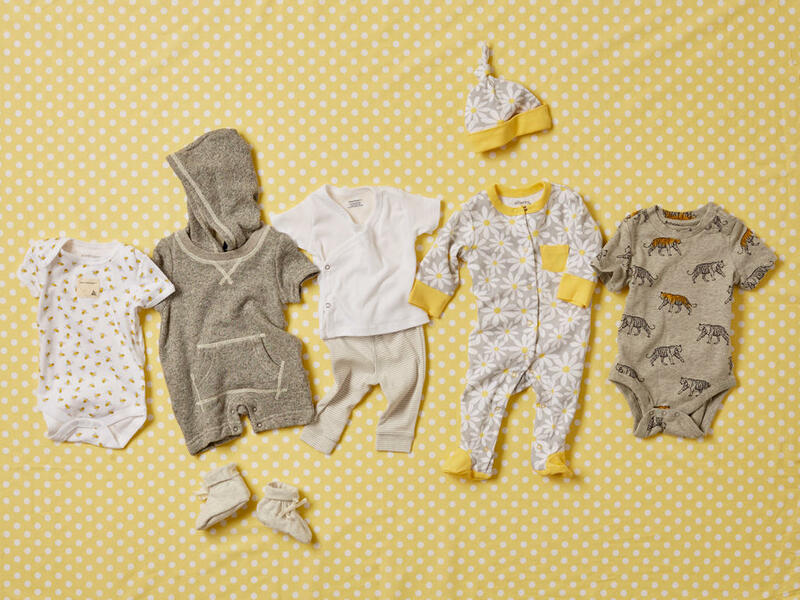 Don't buy too many clothes, as newborns usually grow quickly, and might be a different size than you expect. When buying more clothes, bring ones that fit already so you can compare sizes. Different stores and even different brands might have different sizes for the same tag size. Also, try to buy clothes that are convenient and comfortable over what is cute, though that is fun. Clothes with snaps or zippers and those that are stretchy are good, while clothes that are really tight or have loose ribbons and strings will most likely be bad for the baby. Clothes that undo around the crotch make for easy changing. Pieces with built in feet are convenient because socks can sometimes slip off. Layering is a good way to dress your baby. Each piece can be easily taken off when you go inside, and is easily removed when soiled. An easy way to keep your newborn warm is to swaddle them. This is a special way of wrapping a blanket tightly around them. To start, lay out the blanket, and fold over one corner. Put the baby face up with his neck on the flat side made by the fold. Fold first the left, then the bottom, then the right corner around him. The snugness will give your baby a sense of security, but don't make it too tight. Always remember- make the clothes fit the baby, don't make the baby fit the clothes. For example, stretch the arm hole and pull the hand through, don't jam the arm in the sleeve and squish it through. Be gentle, the baby is delicate. When putting on something that opens on the front, pick up the baby and tuck it under. "Dressing Your Newborn." Healthychildren.org. American Academy of Pediatrics, 21 Nov. 2015. Web. 6 Jan. 2016. "How to Dress a Newborn." What to Expect. N.p., n.d. Web. 06 Jan. 2016. "Dressing Your Newborn for Any Type of Weather." What to Expect. N.p., n.d. Web. 06 Jan. 2016. Amalah. "Baby 101: How to Dress a Newborn." Alpha Mom. N.p., n.d. Web. 06 Jan. 2016. "Baby Clothes for the First Six Weeks." Baby Center. N.p., n.d. Web. 06 Jan. 2016.